My first destination when I enter Trader Joes is the little spot in the back corner that offers free samples of various items from the store. I recently tried a polenta casserole that was made with their prepared logs of polenta, salsa verde, shredded three cheese mix, and pork carnitas. I purchased all the items I would need except for the polenta. I knew I had a box at home and prefer making it myself. I was pleasantly surprised at how tasty the salsa verde was. The casserole was great, and now I have a new way to prepare polenta, jazzing it up a bit with the salsa verde. It’s low budget, filling, and there are plenty of leftovers for two. I also had a bunch of hot chiles that my significant other’s mom gave to me. I can’t recall what type they were, but she had cooked them up, not expecting them to be so hot and she wanted to share them with us. They sat in the refrigerator in their own juices for a couple of days before I decided that I would make a crustless quiche. I’ve never made a crustless quiche before, but I know that I like frittata and made that, so I searched for a recipe and made modifications. I eyeballed the amount of milk that I added until it looked about the right consistency. I had some leftover bell peppers and the remaining shredded three cheese mix; I added onion, sautéed all the peppers and onion together, let it cool while I tossed the cheese with some flour, mixed everything together. Then, into a greased pie pan. 30 to 35 minutes later, the crustless quiche had set. The aroma of peppers and cheese was wonderful, it tasted great, and had good heat from the chiles. At Trader Joes, I also sampled Red Leicester cheese with chili and red bell pepper. I tossed a chunk into the basket, even though I already had several other hunks of cheese in the refrigerator. On Sunday, I fixed a plate of pita crackers with the various cheeses that we had on hand, including this new Red Leicester, and a small slice of truffle mousse pate that we got at BevMo. I brought M. a beer, a water for me, and we enjoyed or plate of treats in our backyard on our weathered table that we found for a bargain at an estate sale over the weekend. I had a hankering to prepare navy bean soup on Sunday, but the day got away from me. I ended up making it on Monday instead. I love soups in general, and navy bean has always been high up on my list. The first and only place I had it was a small cafe that I haven’t gone to in ages and don’t go to any longer. The memory of going in on a day that navy bean was their featured soup was always a dilemma and a highlight. I would have to decide between my other favorite choices or the soup that they only made once a week. This is the second time I’ve made navy bean soup. I follow the recipe on the back of the navy bean package with modifications to suit my taste. It’s not a soup that I will make often because I’m sure the sodium content in those scrumptious ham hocks would tilt the sodium meter into regions I shouldn’t be in. I reheated a bowl of leftover soup yesterday and my taste buds were savoring the creaminess of the navy bean and potato together with the rich flavor of the ham hocks and the hint of thyme throughout that brought an earthy, green goodness to the soup. Bread was in order for this soup. I was going to fall back on Jiffy corn muffins, but (a) I hadn’t actually bought any and (b), I wanted to make something from scratch. I didn’t have a whole lot of time. I thought about making baking power biscuits. No, too bland. 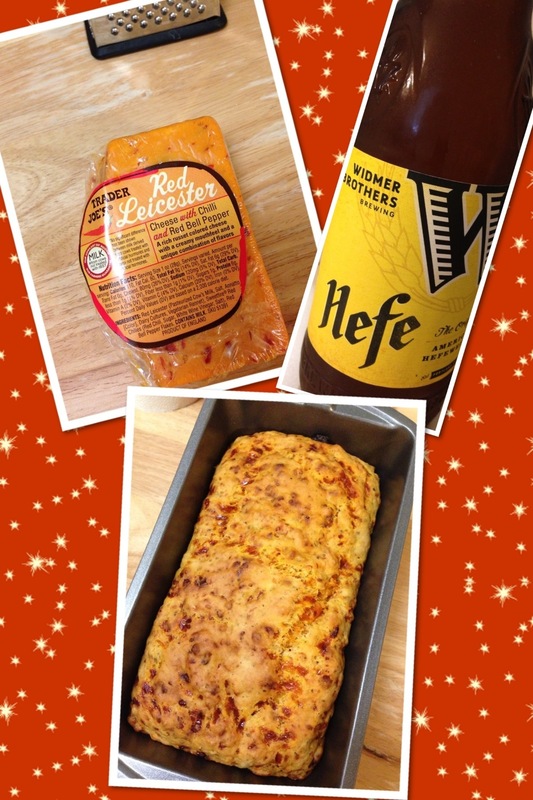 Then I saw a recipe for cheese and beer bread. Perfect. I had all of the ingredients, except I didn’t have regular cheddar cheese, so instead I used the rest of the Red Leicester. I did a Google search about the cheese so I could see if it was actually good to cook with, and I learned from Wikipedia that this is a British cheese, similar to cheddar with a crumblier texture, which is true. It’s a cow’s milk cheese, originally from Leicestershire, England. I’m glad that this cheddar beer bread recipe made me seek out and learn just a little bit more about this new cheese–new to me, anyway. The bread looked great. I thought it tasted good too, but it could have used a little something extra. M. agreed. The second day, though, when I took a slice to have at work with my lunch, I thought it tasted great. It gave me the sense that it was made with yeast from a package. I will definitely be making this bread again. I followed the recipe in my trusty Better Homes and Gardens Cook Book. Simple, straightforward and low fat! Next time I want to try the Cheddar Spoon Bread recipe. I don’t do most of my shopping at Trader Joes; though, I do go there for certain items and they have a great selection of interesting cheeses at reasonable prices, and other interesting things, of course. I think I’ll make a habit of going to Trader Joes at least once a week. It provides inspiration and tasty snacks to satisfy me until dinner time. The week has been long. Not a difficult week, but because work is slow, the hours–the minutes drag on. I have been handling the slow period much better, though, trying to still be productive during this lull before the new busy season arrives, which is a ways out. Soon, though, I expect other work to trickle in–the late birds. September will bring two new classes that will indirectly apply to work. I say indirectly because while they very much can apply to work, I’m doing it for myself. I’m doing it to pave a path that is out in the distant future, and I’m doing it because I have an excuse to continue to be back in school, to be back in the routine and structure. I have already begun reading one of the books for class: managerial accounting. It is actually more interesting than I thought it would be; and I can see how it will challenge me. I’m also taking a business management course called Group Behavior and Leadership. I’m looking forward to this course and, although, our work group is small, I can imagine that I will be able to apply this course to my current job–at least it will offer interesting tidbits and the topic itself captures my interest. I sit here at the kitchen table, look up from the computer screen, peek out the window, admiring the lipstick pink carnations that I bought for the table, listening to music, drinking decaffeinated coffee, easing into this Friday, looking forward to what the day brings. It has been a week of firsts. 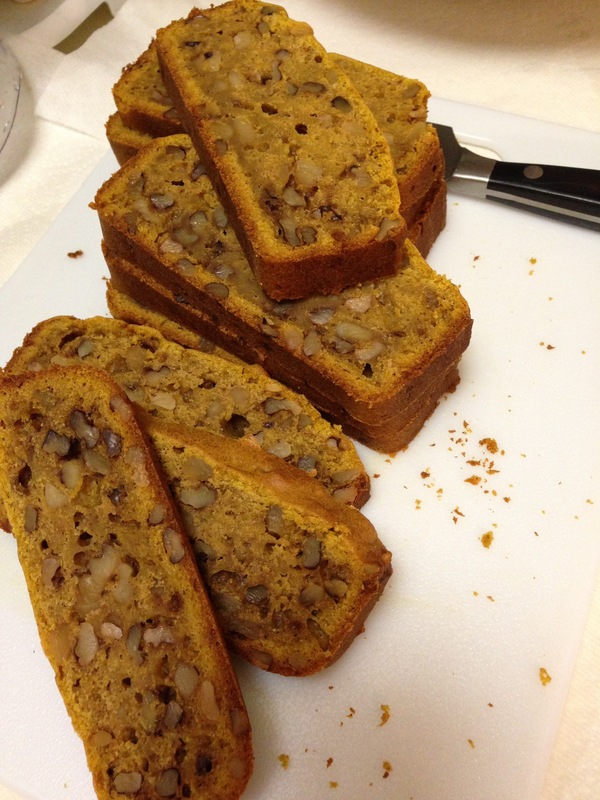 I’ve had it in my mind to make pumpkin bread for the longest time. Not until I had all my ingredients and reading through different recipes and comments, did I think to myself: what better time to bake pumpkin bread than the weeks leading up to Autumn. I decided to double the recipe in my Better Homes and Gardens Cookbook, since it seemed a waste to bake one loaf for an hour. I also had to buy muffin tins. The aroma of warm pumpkin, nutmeg, and cinnamon filled the house. Autumn scents on a hot summer day mingled with the warm breeze pushing through our open windows. I think the bread was successful. It tasted delicious, but when I packed the slices in a plastic container, it began to sweat and get sticky. Next time, I may need to bake it an extra 5 minutes and keep it unsliced in its pan with a towel over the top. On Tuesday, I made meatloaf. I had always loved it when my step-father made meatloaf with roasted potatoes. This was my first time making it. I laughed at myself as I molded the loaf in the roasting pan, realizing that these two first-time cooking experiences, in our new home, were loaves. Was it a coincidence? Was there some subconscious activity at play here? I surrounded the meatloaf with small red potatoes, sweet potatoes, zucchini, and carrots. I also had my first experience pulling weeds. I’m sure I’ve pulled a weed or two here and there, but I haven’t had a backyard since my childhood home. It’s a yard with dried grass that looks like straw, dried dirt, rocks, leaves scattered here and there, two trees, and small patches of green that I cannot tell yet if they are weeds or ground cover. The yard is peaceful to me. It has potential. I have ideas, but I have to take it slow. Grass is not an option, with the cost of water, this being a rental, and being conscious of our budget, I have to be realistic. I bought three potted plants. The first flowering plant that I knew I would buy first was a geranium because geraniums remind me of my grandmother. We will get a piece of cactus and grow it in a section of the yard. I’ve checked out several books from the library to get ideas on low-water gardening. One that has potential is The Low-Water No-Water Garden: Gardening for Drought and Heat the Mediterranean Way. So many wonderful ideas! I’ve always loved succulents and I think they will do perfectly once I figure out where they might go. It’s a wonderful realization and mind-opening experience when you can come to something with fresh eyes and I’m glad to have that opportunity. On car rides or walking, I always admire gardens, but now I’m looking at the gardens I pass with a new lens, with a focused lens. It reminds me of when I’ve taken art classes–coming away with a heightened perspective on how to view the world. To firsts, new experiences, memories, change and being aware of the many lenses that either we choose or that choose us. The 13th of August was an interesting day. A day where the crepe myrtle I passed looked especially lovely, her curved arms an embrace, comforting the invisible person by her side or perhaps it was the breeze being caressed by her and then as I approached behind a car, waiting for the light to turn, I saw a boy–well, a young man and he almost got pummeled by a car that wasn’t watching for pedestrians. The boy’s body curved into the car as the brakes screeched. His body moved with the quickest of reflexes. He ripped his ear buds from his ears, perhaps to fully take in the fact that his life just flashed before him. My hands came up to my head as I let our a little cry, as I was a witness to this almost horrific event. On the 13th people seemed especially open and friendly and I too felt a lightness and openness in my being, a go with it feeling, rather than pushing against the current. Appointment times got mixed up; instead of being fussy, knowing I had an email that showed I was right, I took responsibility and apologized to put the other person at ease. It didn’t matter. It was a trifle not worth fretting about. Just these little things added to the day–added to shedding the feeling, of the need for control and simply moving along with the course of events, however big or small. I had purposely scheduled a certain appointment on the 13th related to my old apartment because the 13th is a day that feels positive, that feels filled with hope, balance, and goodness. The 14th turned out to be the other side of 13. It wasn’t a bad day, exactly, but it felt as though all the wonderfulness of the 13th had been rubbed out, yet because the 13th had such an impression upon me, it was still a special day and 14 wasn’t going to mess that up for me. I would have to put into practice all that 13 had to teach me about giving up control. So on the 14th, the cable person showed up on the late side of the appointment window, which would mean I was probably going to be late to work. I had mentioned it to the boss and kept him posted. The cable person ran into a bit of a glitch with the second outlet. He proposed one solution that would involve a temporary solution and would require that he or another technician come back. Then he thought of another solution that was acceptable, but not perfect. In the course of checking and re-checking, he found a final solution, but all of this took time. I had already had a small bowl of cereal, but was quickly becoming famished and I felt a headache coming on. I knew that as soon as he left, and I left for work, I was going to stop for a quick snack somewhere. At last, I’m out the door, everything working properly. Cable and internet ready. I did the stupidest thing I think I’ve ever done in my life (and I don’t even like using the word stupid and mostly never use the word), I failed to take her number, her registration, nothing. I just agreed that all seemed well and we both parted. I pulled into a fast food joint’s drive thru and ordered onion rings and a coffee. Out of coffee. Fine. I’ll take a Sprite. As I pulled out of the lot, I looked to the left and the sky looked rather hazy, then I started feeling faint and slightly anxious. I pulled over and tried to relax. I pulled over to call the boss to let him know that I was on my way, told him what happened, and said that I felt a little woozy. He asked if there was something I wanted him to do. I said no that mostly I wanted him to know that I was on my way and if I didn’t make it, he’d know why and what happened. I made it to work fine and think that I was still just shaken up and that my body was in need of food. What stood out for me in these two days is how on the 13th I felt so grand and how the 14th tested me. The 13th reminded me that even when everything is going along wonderfully, even then we must stop to appreciate those little moments, knowing how fleeting they can be, and it is good practice to stay in balance. It just felt like there was so much love and something magic in the air on the 13th. I can’t even fully explain it. It was like walking around in a cloud of love. We all have these days, with our ups and downs, and surprises. I feel grateful…the days make me feel grateful to be alive, 13 or 14–no matter which day it is, they all have something to offer and they each have different elements within them to appreciate and to revere. since the Fourth of July. Searched neighborhoods for apartments, responded to endless ads–some too good to be true. We moved on, regrouped. Started again. Appointment after appointment, none that we were inspired to call home, except for one that was not available, but there were possibilities in the near future; we were put on a waiting list. Scanning and scanning, I saw one, passed it over in exhaustion. M asked me the next morning if I saw a certain one–the one I had looked at but for some reason hadn’t pursued. I looked again. Should we call? It couldn’t hurt. And so we made yet another appointment. There were several others viewing the apartment. As we walked through, it felt good, like a place we could call home. We were both in agreement. Throughout our search, we had taken applications; though this would be the first we submitted. Talk about putting one big egg in a single basket, rather than spreading the eggs around. We asked lots of questions, walked through the space once, twice, three times, maybe even a fourth. Opened cupboard doors, closet doors, trying to imagine where things would go if this were our new home. We submitted our application that night and waited to hear if we were approved and selected. One and a half days later, we, along with a few other applicants were in the running. We were the strongest so far…just a little bit longer until she checked a few things out. I wore one of my lucky necklaces that day. The decision came, and I’m happy to say that we now have a new place to call home. Soon we will move in. It’s been a draining process. I’ve already started packing and am overwhelmed with how many boxes of books there are. I feel guilty. The move would be much easier without the books. I couldn’t part with any this time. I’ll take them all along. Change is scary and exciting. So many unknowns. But change is good. I’m looking forward to our fresh start together–our new adventure.